Let there be sweets! A girls gotta have her treats! Yum-O! 1. Mash the bananas and then add egg whites, protein powder, oats and cinnamon, mix and pour into cupcake pans to make 18 cupcakes. Bake at 350 Degrees for 15 minutes. 2. Mix Cream cheese, vanilla extract, Truvia and maple syrup together to make the creamy topping. 3. 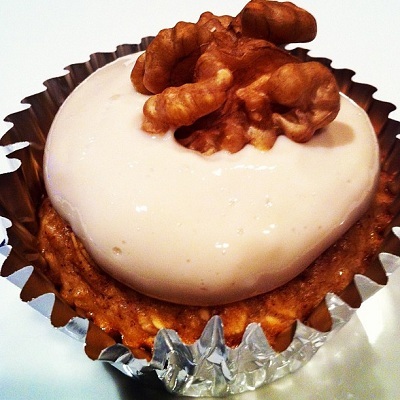 Cover cupcakes with creamy topping, then top with 1 walnut halve each.